Nevermind. A new update has been released that has fixed the issue. Seems that file is not the issue either, @joekamprad. Thank you though, I appreciate it. @joekamprad I don’t believe I do. Says no file or directory. I’m assuming this is either a new component that is necessary or something that might have gotten deleted on the latest Cinnamon settings update. (I noticed a few the other day). 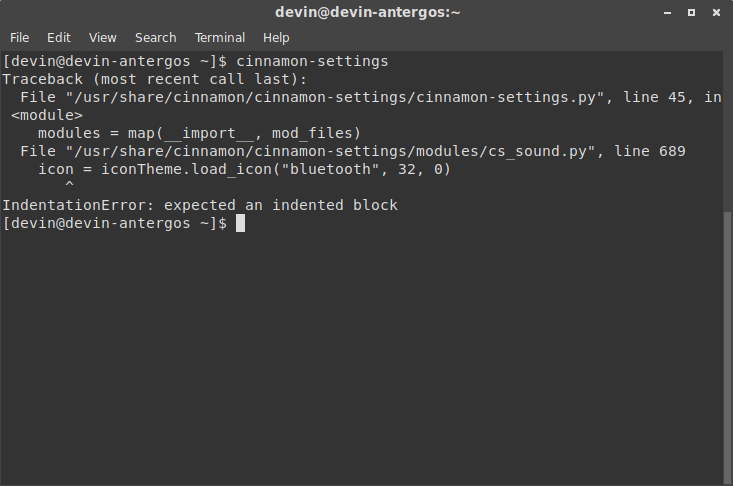 Trying to run cinnamon-settings from my terminal results in the current output. I don’t think it should be too hard of a fix, but I know this is an error for all 5 of my machines that run Antergos. Just wanted to let someone know. Hope to see the error remedied soon. So, I believe that last one should work, but I just want to make sure of something before I go much further in depth with this. Is it asking me to recompile my kernel with CONFIG_ACPI_REV_OVERRIDE_POSSIBLE=y as a parameter? If yes, is https://wiki.archlinux.org/index.php/Kernels/Traditional_compilation a good source for learning how to do that? Here’s this if it helps any. Here are the results for those commands. I installed tlp. It still does not detect battery on start up. Here is the output it gave me. Notice: tlp.service is not enabled -- invoke "systemctl enable tlp.service" to correct this! Notice: tlp-sleep.service is not enabled -- invoke "systemctl enable tlp-sleep.service" to correct this! It is not able to display battery info either. Basically. I’m really unsure as to why. It’s not just the installation either. It’s the same with live disks as well, or completely different installs. Well, I was just wondering if this was a common problem, or if it was just my computer. I believe it is the latter because this problem only occurs on this laptop, and it is persistent regardless of Linux distro whether it be Debian, Fedora, Gentoo, or Arch based. Also, it only seems to happen with Gnome based DE’s. KDE did not that this problem. EDIT: Oh, I forgot to mention. The icon and battery status updates upon power actions such as the power cord being plugged/unplugged, but it will only update for that instance. It will not update as the battery charges or drains.